There is nothing at the published coordinates, and they will not be updated as the caches move; neither will the D/T rating. The mythology of Orpheus and Eurydice is well known. Their tragic love story can be read on many websites, but my favourite is probably the somewhat irreverent summary at a website called shmoop. The tale inspired this geocaching experiment. Either that, or the concept randomly occurred to me and then I reverse-engineered a tenuous theme; it's hard to remember now, as the simple premise developed some complexity along the way. Anyway, here is the concept: a pair of moving caches that must remain inside the underground system known as Box Freestone Mine at all times. Unlike most of my other cache adventures, this is also intended to be relatively mystery-free. With no cryptic codes or ciphers, and very little puzzling, it is almost a Traditional, except, of course, it isn't quite. There is moving cache guidance on the opencaching wiki. A moving cache changes its location after each find. Everyone who finds it moves it to a new location and publishes the new location in their log (but this cache is slightly different in this respect, as you will learn). 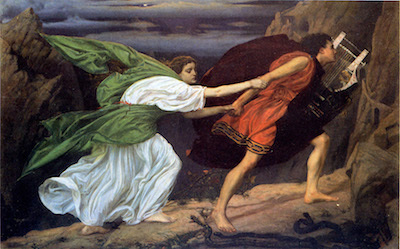 In this example, there are two moving caches: one called Orpheus, the other called Eurydice. Both must be found, and both must be moved afterwards. There is a puzzle but it is not intended to be hard. In practice, it only provides a basic mechanism whereby genuine seekers are not unduly impeded and casual browsers are not inadvertently tempted into an adventure that requires a good level of underground experience and a significant amount of planning. According to the myth, during his quest Orpheus charmed a certain character, a descendant of whom has tracked me closely as a caching companion for several years. To progress your quest, navigate to bit.ly/?????? ?, where the missing alphanumeric characters are provided by my companion. When you are prompted for a password, use the species of my companion (single word, case-sensitive, don't over-think it). The logging protocol will become apparent thereafter. Amberel kindly custom-made one of his Top Cache geocoins for this cache. It is called Orpheus' Lyre and is trackable on its geocaching.com webpage. I have chosen to hide it as a RESIDENTIAL geocoin alongside Orpheus' logbook. I hope that you will discover it, if you like to see coins and collect icons (as I do).